The term “shin splints” refers to pain and tenderness along or just behind the inner edge of the tibia, the large bone in the lower leg. Shin splints–or medial tibial stress syndrome usually develops after physical activity, such as vigorous exercise or sports. Repetitive activity leads to inflammation of the muscles, tendons, and periosteum (thin layer of tissue covering a bone) of the tibia, causing pain. The bone tissue itself is also involved. A primary culprit causing shin splints is a sudden increase in distance or intensity of a workout schedule. This increase in muscle work can be associated with inflammation of the lower leg muscles, those muscles used in lifting the foot (the motion during which the foot pivots toward the tibia). Such a situation can be aggravated by a tendency to pronate the foot (roll it excessively inward onto the arch). Similarly, a tight Achilles tendon or weak ankle muscles are also often implicated in the development of shin splints. Shin splints cause pain in the front of the outer leg below the knee. The pain of shin splints is characteristically located on the outer edge of the mid region of the leg next to the shinbone (tibia). 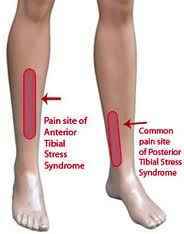 If not managed appropriately, this condition can progress to a tibial stress fracture. A very effective method of treatment has been found to be A.R.T., Graston therapy, along with cryotherapy. Active Release Technique® (ART®) applied to the tibialis anterior is often used to reduce spasm and scar-tissue within the muscle. Rather than just addressing just one area, ART® restores unimpeded motion and function to all soft tissues. Graston therapy is a soft tissue technique aimed at breaking up scar tissue and adhesions to promote the rebuilding of scar tissue in the correct line of force to strengthen the muscle, increase flexibility and movement, and promote normal function of the soft tissue. Graston therapy incorporates the use of stainless steel tools that are used to detect and treat scar tissue within muscles, ligaments, tendons, fascia, and all other forms of soft tissue. By breaking up this poorly formed scar tissue and encouraging the body to form healthier and stronger scar tissue. Kinesio tape will also be applied over and around muscles in order to assist and give support or to prevent over contraction, affecting change in deeper layers of fascia by manipulating the skin and muscle and creating space underneath the skin to. I will also show you proper stretching for the gastrocnemius and soleus (calf). Set up a consultation below to discuss how I can help you with your shin pain. Get the treatment that you deserve at BackAndHealth.